John Lantrua was born near Triora in Liguria on March 15, 1760, of pious and respectable parents, and passed his boyhood days in great innocence. In his seventeenth year he joined the Order of Friars Minor. He pursued his studies for the priesthood, and after he was ordained he was appointed lector of theology at Corneto. He governed the communities at Corneto and Velletri with the singular prudence with which God blessed him. Feeing himself called by God to a life of greater sacrifice, and, burning with zeal to go to the Chinese missions, he petitioned this favor, which was granted in 1790. He hastened from Rome to Lisbon, and from there intended to take passage to China. As no opportunity presented itself to sail from Lisbon, he was forced to remain there a whole year. At the end of this time he boarded a ship for Macao, from where he shortly entered the Chinese empire. For sixteen years he labored with apostolic zeal in the provinces of Shensi and Hunan, which offered an abundant harvest. He was the only priest in this vast region, but he visited each and every Christian community. The difficulties involved could not deter him, neither could the dangers of the journeys restrain him. He restored sacred institutions which had practically fallen into decay, and expelled the shadows of superstition. He meditated assiduously on the sufferings of Our Lord, and the ardent zeal with which he was inflamed, led many idolaters to the true Faith. His zeal for the salvation of souls prompted him to pass whole nights in prayer and in scourging himself. God rewarded this ardor in spreading the Gospel by working great miracles through him. He caused a spring which had run dry to flow again by merely making the Sign of the Cross over it. Another time someone struck him wihile at prayer, and the offender was instantly killed by a serpent’s bite as John had predicted. Blessed John of Triora continued the work of spreading the Christian religion, but at last he was apprehended and brought before the magistrates. To the questions that were put to him he answered in a manner worthy of the ancient martyrs. He was bound with chains and forced to make a long journey on foot. He spent seven months in prison, enduring tortures too cruel to describe. With iron chains around his neck, and his hands and feet tied, he was dragged violently to a cross which lay on the ground, that he might tread on it. But this he refused to do. Then the sentence of death was pronounced upon this athlete of Christ. 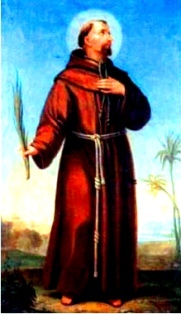 Blessed John of Triora was led to the place of execution, where he prostrated himself five times to adore Our Lord and to give public testimony of his faith. He begged the executioners not to strip him completely of his garments. This favor having been granted, he directed the guard to give his commands. He was fastened to a cross and strangled at Changsha on February 7, 1816. His death was followed by great signs and wonders from heaven. The body of the martyr was taken to Rome, where it lies under the altar in the church of Aracoeli. Pope Leo XIII, in the jubilee year 1900, beatified Blessed John of Triora and seventy-six others who had suffered martyrdom in Annam and China. His cause of canonization is now under way.